The Royal Mint of Canada has released a five-ounce silver coin with a mother of pearl inlay honoring the 100th anniversary of the Trans-Siberian Railway. The issue costs $549.95 and has a mintage of just 750 pieces. 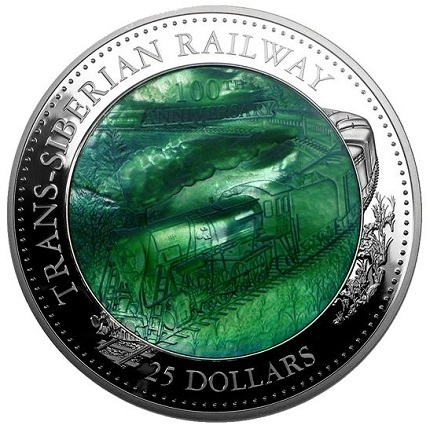 The obverse features an image of a train speeding down the Trans-Siberian railway, rendered in the vivid green of mother-of-pearl. Placed along the rim in silver are the inscriptions TRANS-SIBERIAN RAILWAY and 25 DOLLARS. 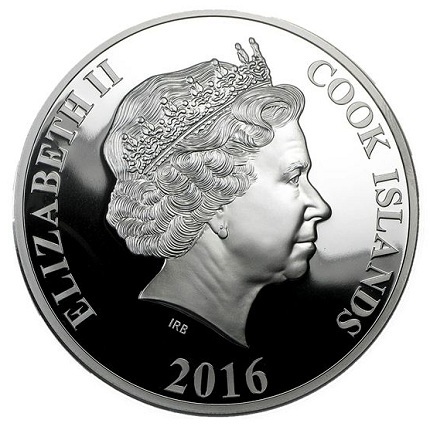 The obverse features Ian Rank-Broadley’s portrait of Queen Elizabeth II, with the inscriptions ELIZABETH II, the country of issue, COOK ISLANDS, and 2016 located along the rim. The coin measures 65 mm in diameter and is composed of silver that is 99.9% pure. Its packaging contains a certificate of authenticity. For more information, please visit the Web site of the Royal Canadian Mint.